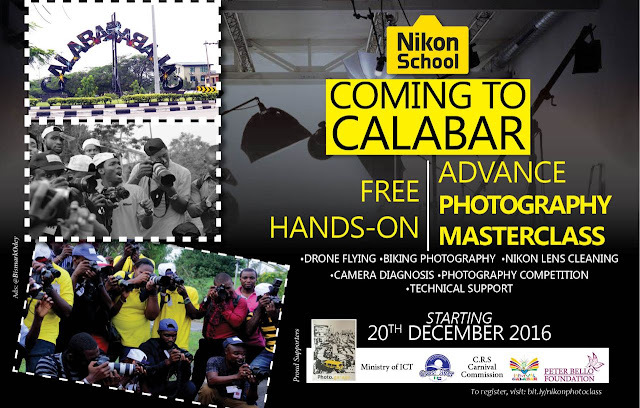 masterclass to educate Cross River youths on the skillful art of Photography. Nikon, a leading brand in photography equipment is spearheading this initiative. The classes which will run from the 20th – 21st of December, will feature lectures on Drone, Bike, Documentary and other forms of photography from leading photo experts. Facilitators will include leading photographers such as Uche James Iroha, one of Africa’s leading documentary photographers alongside others. Earlier in August, the Peter Bello Foundation organized a photography masterclass that featured top notch photographers like Kelechi Amadi-Obi, Kola Oshalusi, Daniel Cobhams amongst others. The foundation in the line of its primary objectives is partnering with Nikon and the Cross River State government to ensure the smooth running of the masterclass. To register for the MasterClass, please log on to http://bit.ly/nikonphotoclass and fill the form. Registration closes on Thursday, 15th December at midnight.